For 30 years KIWI has cleaned all rugs, including oriental and area rugs, by hand ensuring the beauty of these finely woven works of art. At KIWI Rug Cleaning, we carefully hand wash your Oriental rugs at our rug cleaning facility using high-quality state of the art techniques. We know that quick submersion in strong cleaning solutions can damage delicate weaving in rugs and result in dye bleeding, migration, and fading. Therefore, our professional crew always cleans rugs by hand, using gentle cleansers that are pH balanced and have a sweet citrus smell. To ensure the best results, our Oriental rug cleaning process involves a series of steps. Rugs are never submerged into large vats of liquid. We prefer the oldest, hand-cleaning method to protect dyes from heavy bleeding, particularly in expensive heirloom rugs. We pick up and deliver all the rugs that we clean. rug cleaner specialists are equipped to do it all and perform the best rugs cleaning possible. Every rug is one of a kind and KIWI understands and appreciates the individuality of each piece. Each one is woven and tied to create a beautiful heirloom piece created from generations of knowledge and cultural heritage. The rugs are usually crafted with organic dyes that are specific to each culture and region. When cleaning a rug we take great pride and care in preserving the integrity of the dyes and patterns and never submerge any rug in liquid. We take care in identifying each piece. Knowing the type of rug that we are working with is vital in determining the cleaning method of your rugs and ensuring that we do everything possible to protect rug dyes from bleeding or migrating. We also have an intricate drying process that ensures your rugs are not left wet. We also can remove pet odor. When cleaning Oriental rugs, wool rugs, area rugs, area carpets, and others, this is the very important part of the cleaning process. There are no two rugs alike. And often the most valuable heirlooms were hand crafted, hand dyed, and hand woven. In many parts of the world, rug dyeing is a family tradition – a skill that is passed and improved on through generations in families. 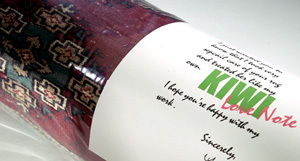 The dyes are often organic – with the richness of their colors coming from plants, fruits, berries, nuts and roots. KIWI also offers the best in carpet cleaning with a One-Year Carpet Cleaning Warranty. If you need rug repair including dyeing, re-weaving, re-fringing or more, our Rug Repair team can provide a free estimate for this work. Click here to read more about rug repairs. Oriental rugs are usually either knotted with pile or woven without pile by skilled workers from different cultures, countries, racial groups and religious faiths who are involved in the production and design of Oriental rugs. These Oriental rugs are classified by origin: Persian rugs, Central Asian rugs, Anatolian rugs, Caucasian rugs, Kurdish rugs, Chinese rugs, East Turkestan rugs and Tibetan rugs. At KIWI, our rug cleaning team takes the utmost care in hand cleaning both sides of your fine rugs. Oriental rug cleaning requires special care and extensive experience. Here at KIWI we understand that generations of knowledge and culture go into creating each imported rug and with 30 years of rug cleaning experience, we pride ourselves on providing the best cleaning services available. We mastered every part of our Oriental rug cleaning service to ensure the lasting quality of your cherished treasures. Our Oriental rug care team will make sure that each rug is individually inspected for any special needs prior to cleaning and our dedicated service teams will inform you of any repairs or stains that might require extra care. Since built up dirt and debris can cause damage to the fibers of your rug, we carefully clean dirt and dust from both sides of the rug prior to cleaning. Rug cleaning technician tailor their techniques to fit the unique needs of your rug. We use pH balanced Oriental rug cleaning cleaner that will help preserve the integrity of your rug and leave it smelling citrus sweet. Here at KIWI great care is taken to prevent bleeding or migration of dyes. We even dry rugs flat to maintain the strength of the fibers and further prevent color migration. Our master weavers are trained to match fibers, dyes, and patterns and can repair even the toughest rips and tears. 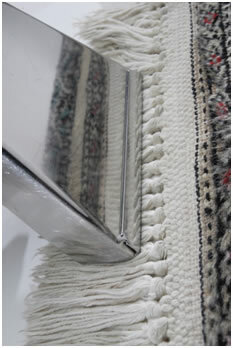 We always inspect every rug for any repair needs and can even repair and replace damaged fringe and binding. Not only can we thoroughly clean and repair your rug, we also have services to help remove embedded odors. Pet urine and smoke can leave lasting smells in your beautiful rug and can be almost impossible to remove by hand. Our unique Ozone Treatment allows us to remove even the toughest odors from your Oriental Rugs. KIWI professionals at out company will tailor all of their services to meet the unique needs of you and your rug. We care for a wide variety of rugs including imported as well as contemporary and domestic. Call us now to see what our highly trained service teams can do for you!